Health is Peace Corps’ second largest sector, comprising 20% of all volunteers. WASHINGTON – Today, nearly 1,500 Americans are serving as Peace Corps health volunteers in 34 countries. Health volunteers are working to improve basic care for people and communities at the grassroots level, where the needs are most pressing and where their impact is the most significant. On Wednesday, at an event held at Peace Corps headquarters in recognition of World AIDS Day, Peace Corps Chief of Staff Michelle Brooks acknowledged the contributions of Peace Corps volunteers to the HIV epidemic response – just one example of the Peace Corps’ unique niche in global health. Over 1,100 volunteers focus on HIV/AIDS education, prevention and care, either exclusively or as part of comprehensive community health projects. Peace Corps contributes to the global response to HIV through the President’s Emergency Plan for AIDS Relief (PEPFAR), the agency’s largest external partner. Volunteers train youth as peer educators, support children orphaned by HIV/AIDS, and create programs that address the needs of families and communities affected by the epidemic. In 2018, Peace Corps volunteers reached nearly 160,000 people through comprehensive HIV prevention interventions, including referrals for HIV testing. 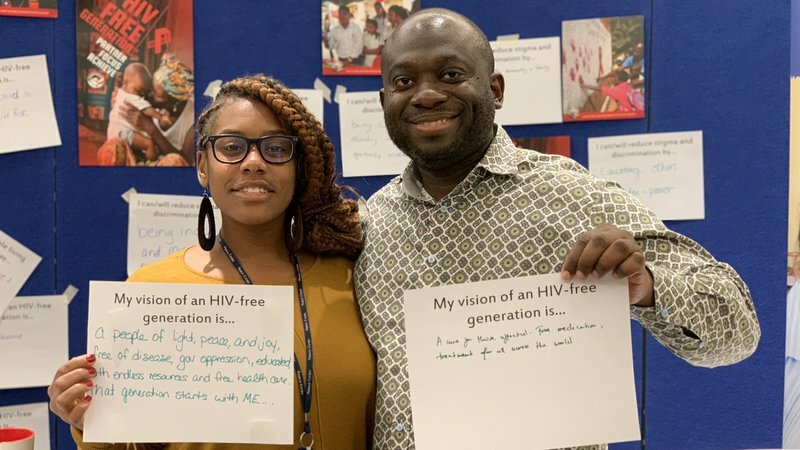 Peace Corps staff share their visions of an HIV-free generation. In addition to HIV/AIDS, Peace Corps volunteers are working to address issues of infant and maternal morbidity and mortality, water and sanitation, nutrition, and youth health and well-being. Health volunteers promote preventative education, strengthen technical capacity, and organize communities and health workers to provide targeted services. Many health volunteers return from their Peace Corps service to pursue careers in public health and medicine, including serving in leading health organizations, such as the U.S. Agency for International Development, the Centers for Disease Control and Prevention, World Health Organization, Health Resources and Services Administration, National Institutes of Health, and more. Read stories from health volunteers here.